Sterling Silver / 14K Gold Diamond Concave Ring.0.135ct. Price includes 30% discount. Imagine flashes of grand light dancing across your hand with graceful elegance. This fashion forward ring is crafted in polished sterling silver, and features 18 full round cut diamonds. They are in 14K yellow gold settings across the concave design. The total diamond weight is approximately 0.14ct with a color of H-I and a clarity of I1. The setting size is 7/16" x 3/4" with a height of 1/16". I purchased this ring from SNBC in 14kt gold about ten years ago--I misplaced the ring about one year ago and have been so disappointed until I saw the ring in your sterling silver line--had to purchase it to wear with my sterling silver braclet. I received the ring today and it is so beautiful...just classy. 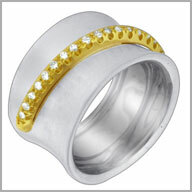 I like the ring so much--am going to have it made in 18kt.